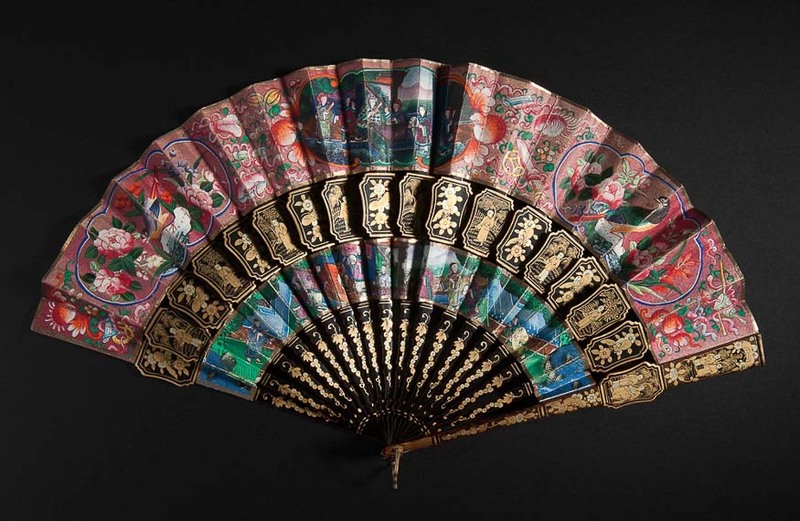 Fans played a significant role in Chinese culture. Used since antiquity by both men and women, they were available in many varieties based on the function they fulfilled, their shape and the nature of their decoration. 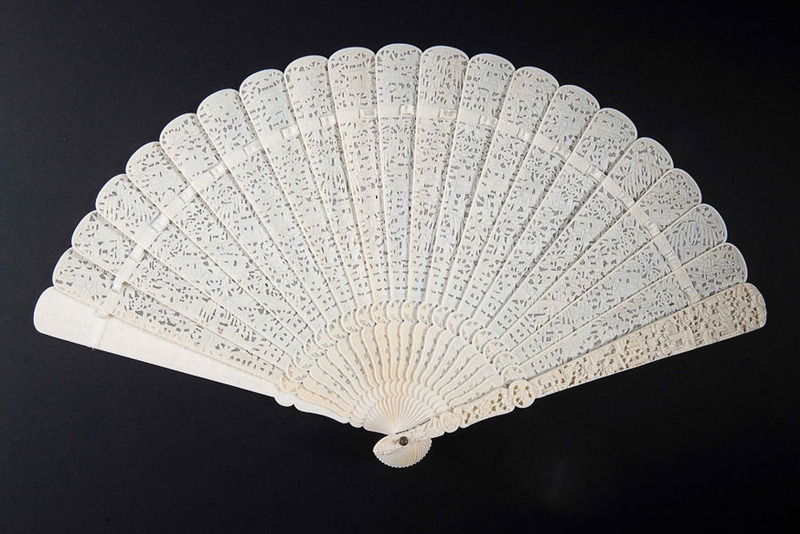 Apart from their functional qualities, fans constituted important ceremonial accessories. In the Tang Dynasty (618-907), they also became a medium for painters and calligraphers. The oldest type was a rigid fan. 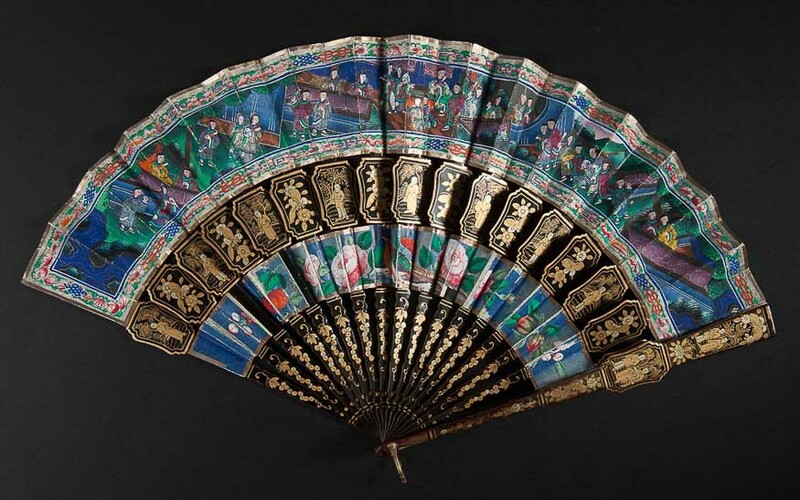 Another, younger type, was a folding fan, popular in the Ming Dynasty (1368-1644). These objects were made of precious materials such as wood of fragrant trees, Livistona chinesis palm leaves, bamboo, lacquer, ivory, tortoiseshell or metal decorated with filigree and cloisonné, silk or bird feathers. 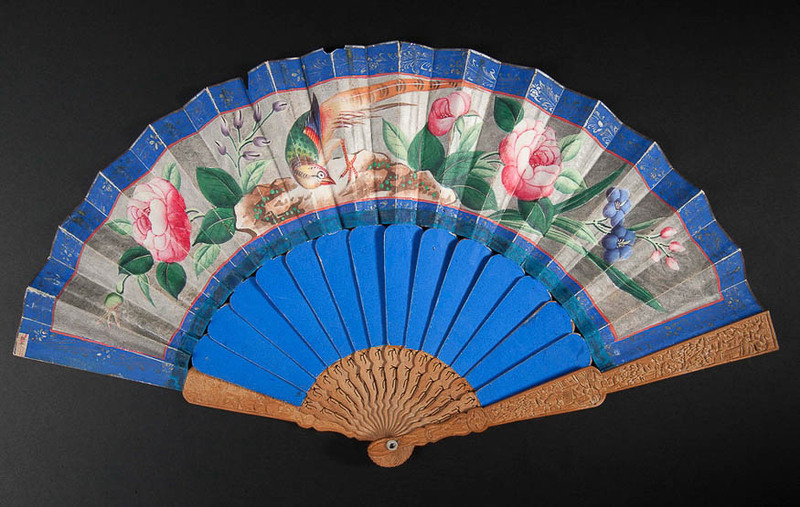 A separate group consisted of fans which were produced for export to Europe in Guangzhou (Canton), Hong Kong and Macau (17th-19th century). 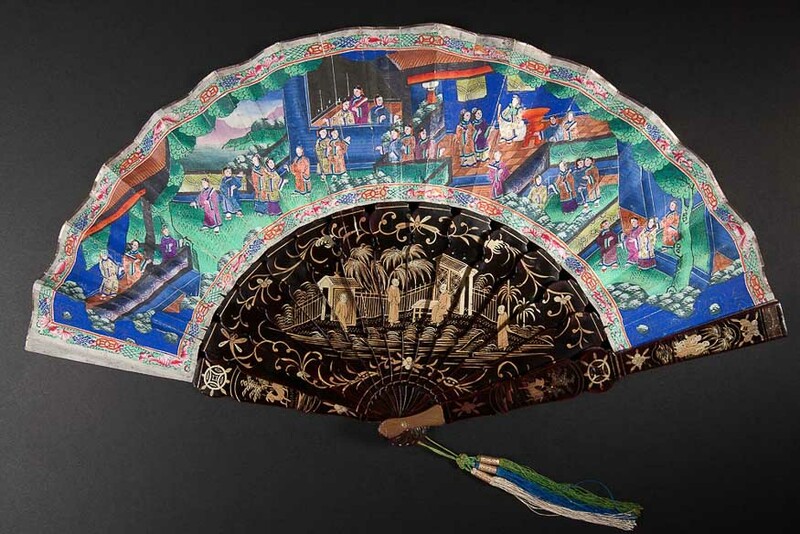 Among them were mandarin fans, decorated with polymorphous scenes depicting Chinese dignitaries among landscape and architecture. Their faces and garments were made as appliques of painted ivory and silk. 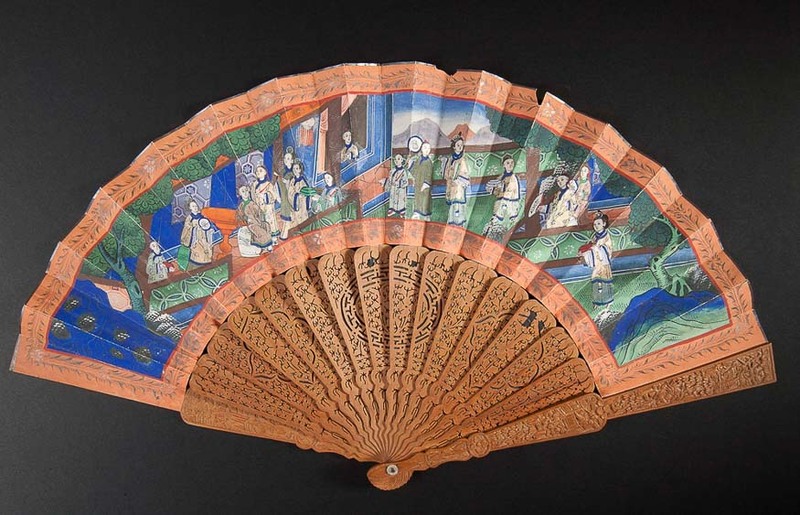 Folding fan Qing Dynasty, first half of the 19th century, wood, paper, bone, silk, ink, watercolour. 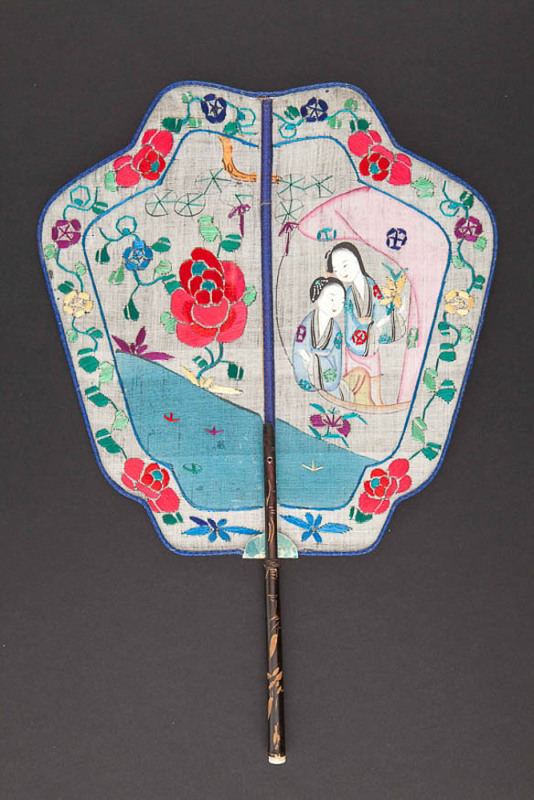 Rigid fan Qing Dynasty, 19th century, silk, watercolour, wood, embroidery. Brise fan Qing Dynasty, Guangzhou (Canton), 19th century, ivory, carved. 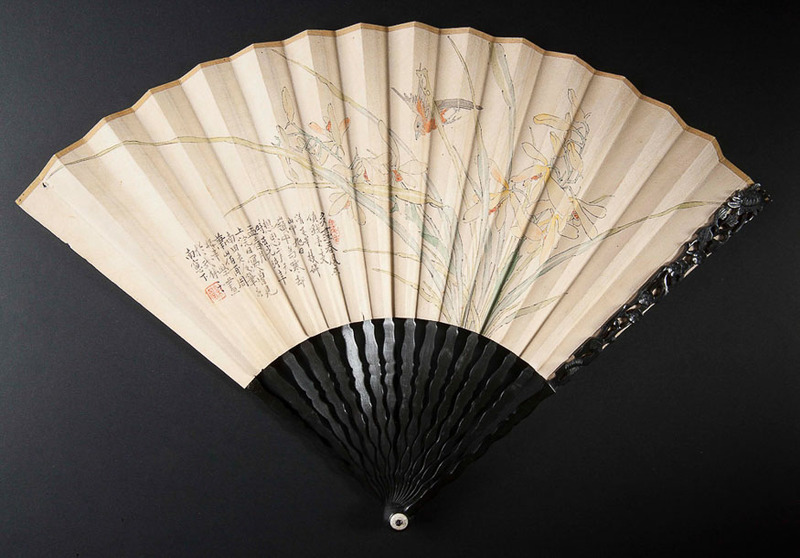 Brise fan The fan was made in southern, Cantonese style, characterized by masterly development of openwork details. 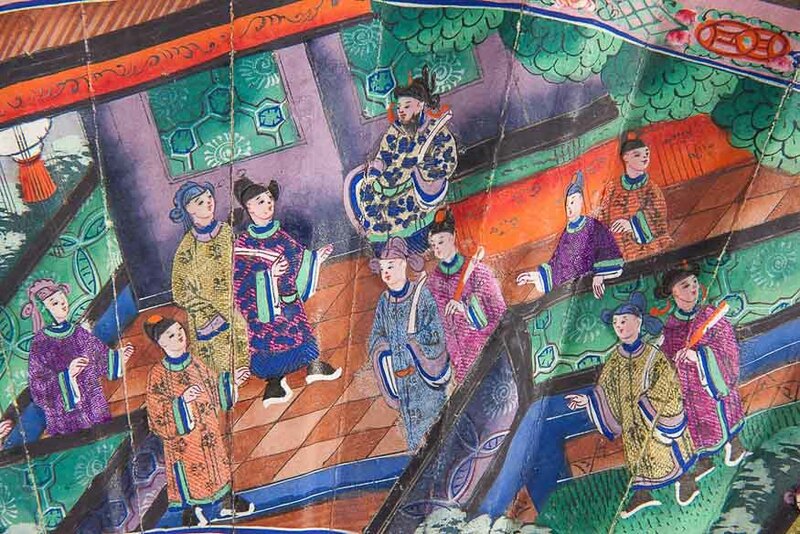 Manufacturers from this region of China were described as „artists weaving with ivory thread”. 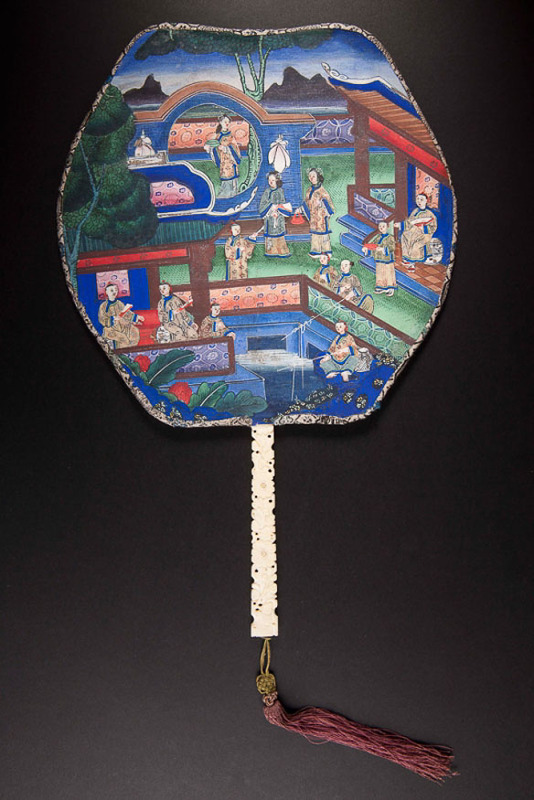 Brise fan decorated with figural scenes in landscape Qing Dynasty, Guangzhou (Canton), c. 1800, wood, lacquer, silk, painted, gilded. More information about this object can be found in the catalogue published by the National Museum in Krakow. 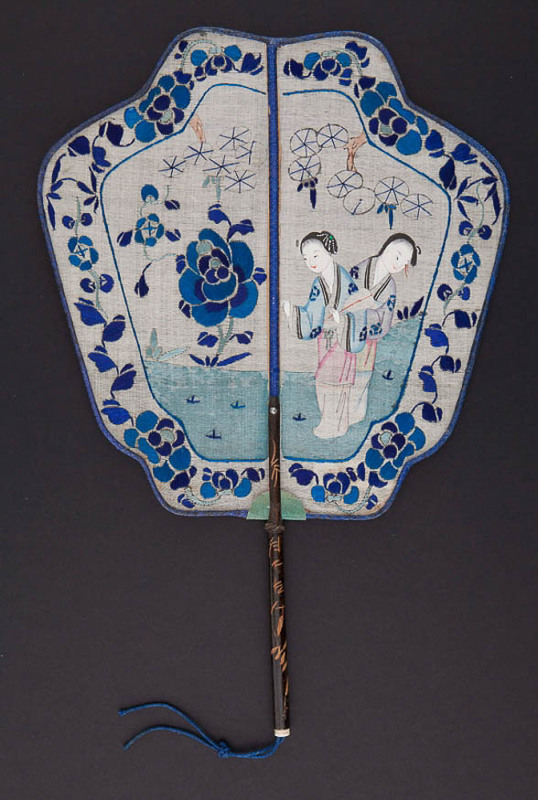 Folding fan Qing Dynasty, mid-18th century, ebony, silk, paper, watercolour. The frame of this fan was made of ebony. 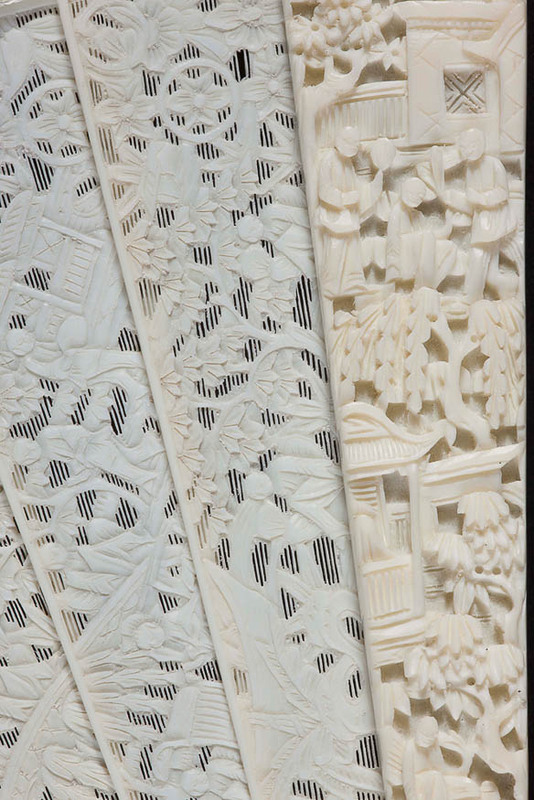 Guardsticks are carved in an openwork manner with motifs depicting rocks, blossoming plum trees and chrysanthemums. The silk cover is painted with watercolours. The obverse features a composition depicting clumps of orchids and a small bird in flight, while the left side presents a poem written in fourteen columns of characters and two seals. The painted decoration refers to bird-and-flower painting (huaniao hua), which over time - as in the presented fan - inspired arts and crafts. 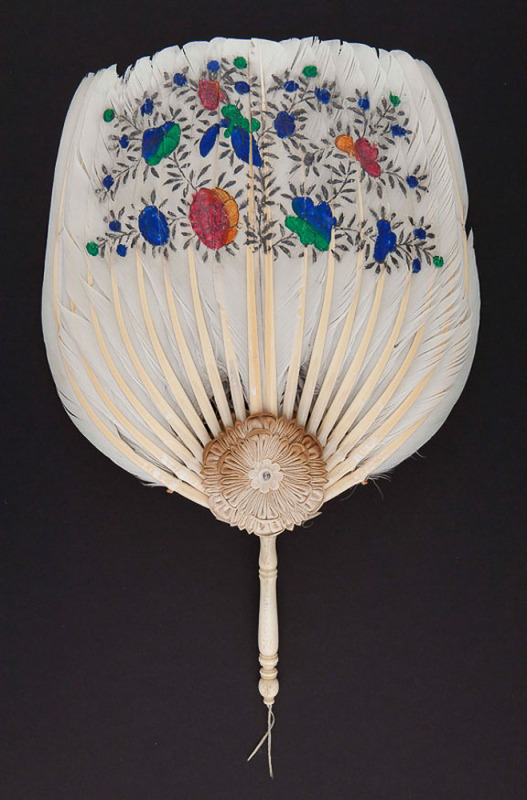 Rigid fan Qing Dynasty, Huzhou, late 19th century, goose feathers, mother of pearl, bone, gouache. Qing Dynasty, Guangzhou (Canton), c. 1850 wood, lacquer, silk, paper, bone, carved, painted. 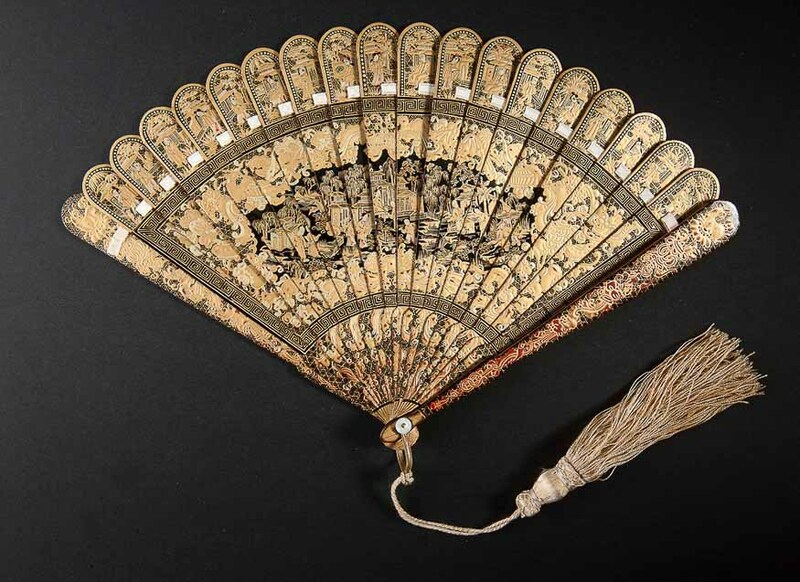 Rigid fan Qing Dynasty, Guangzhou (Canton), mid-19th century. silk, wood, ivory, carved, painted. 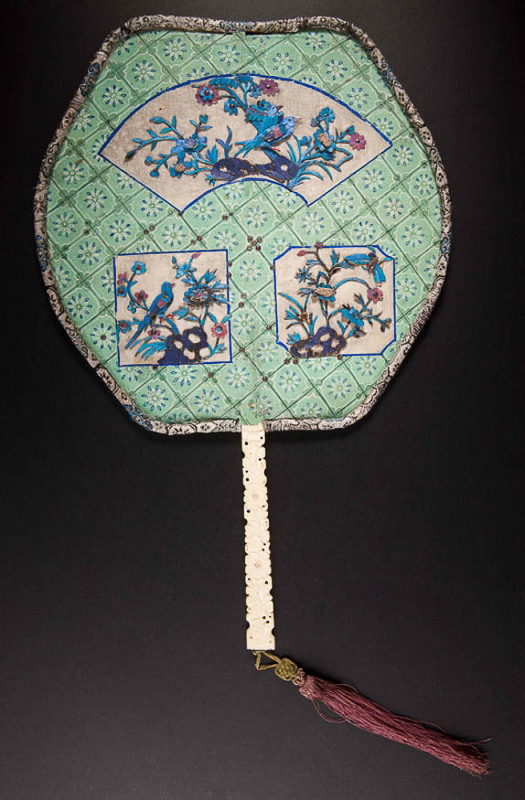 Folding fan Qing Dynasty, Guangzhou (Canton), second half of the 19th century. Folding fan – detail Qing Dynasty, Guangzhou (Canton), second half of the 19th century.